Not everything in life is planned or predictable. Sometimes leaving an employer you’ve been with for 5+ years happens abruptly, and you are faced with many decisions, including how to handle your 401k or similar employer facilitated retirement account. In haste and facing near term economic uncertainly, many people will tap into ALL of their hard-earned 401k retirement savings even before they fully evaluate their near-term financial needs. There are other options to withdrawing 401k funds and we encourage you to slow down before you make such a significant financial decision. If you have just recently lost your job, then you might see that 401k as exactly what you’ll need to get by financially while you are looking for your next job. The sad reality is that you’re only creating a long-term problem for addressing a short-term issue. In today’s economy, on average, it takes individuals an estimated six weeks to find another job. So, for example, that $50,000 in your 401k can look just like the exact amount needed to handle current expenses. However, if you need $50,000 from to cover a couple months of expenses, we have a bigger issue than job loss. IF you pulled every dime of that $50,000 401k out you are going to pay an estimated 25% in federal and state taxes, as well as a 10% penalty for early withdrawal because you have not reached the magical age of 59 ½. And to add insult to injury, you may find yourself in a higher income tax bracket due to the large withdrawal. Now your hard earned $50,000 is down to $32,500. You gave Uncle Sam quite a big day from one transaction. And that doesn’t even factor in the tax deferred growth forfeited in the process. Assuming you are 45 years old and didn’t plan to retire until 60 years old, that $50,000 could have turned into over $130,000. Okay, so if cashing out the 401k account is not the answer, what should I do? Consider a home equity credit line – Home equity lines can be a quick and easy way to get money based off property you own and provide short term relief. Again, it is essential to minimize using the credit line however to facilitate quick repayment once the next job is secured. 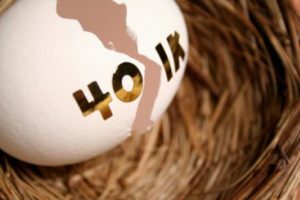 Cash out only a partial 401k amount– If you can keep to a tight budget and have no other option but your 401k funds, then pull out only a small partial amount in order to minimize long term negatives including the tax implications. But wait, what if I’m not comfortable making this choice on my own? If you feel like this a bigger decision that you feel comfortable making independently, consider meeting with a financial professional who specializes in financial planning. Often initial consultations are free and allow for you to focus on your specific scenario and related professional recommendations.